When soldering silver, or any metal for that matter, there are a few variables depending on what is being soldered, but for the most part, you follow the same series of steps each time you solder metal. First, you need to set up a safe area to solder. This will normally require a large ceramic tile, a fire brick or heat resistance pad, and an overhead lamp. The fire brick is put on top of the tile. Also, make sure you work in a very well ventilated area. Some other items you want to have nearby are a pair of copper tongs, a jar of water, small paint brush, your solder and flux, and a pickle pot. Once you have an area set up (we have ours in the garage), next you should make sure that whatever you are soldering together fits well. This often requires careful filing to ensure there is a tight fit. Next, it’s important that whatever is being soldering is clean and free from grease and oils that has been transmitted to the metal from your hands. So, each piece that is to be soldered should be put into a pickle for a few minutes. After taking them out of the pickle, use a pair of pliers or tweezers to handle the metal and arrange it on the fire brick in preparation for soldering. Once the pieces to solder are cleaned and arranged on the brick, it’s time to cut your solder. Just as the metal should be clean, so should the solder. Though you don’t need to pickle it, you want to make sure you don’t handle it a lot. Either use wire cutters or very sharp scissors to cut tiny pieces of solder. Set them aside on your tile for later. A. Use a type of flux called Battern’s. It’s light yellow in color. The flux is applied to the area to be soldered using a thin paintbrush. Then the solder is placed on the metal. This way the flux and solder are heated at the same time. B. The second way is to use a borax based flux that is more like a paste. The flux is again applied with a thin brush. However, instead of immediately applying the solder, the metal is heated first until the fluxed area looks like glass. Then the solder is placed on the metal. If you need some extra time to arrange your solder, then it seems like choice B works better because it also makes the soldered area a little on the sticky side. However, it seems like an unneeded extra step because choice B requires you to heat the metal twice, while choice A allows you to flux and heat the solder at the same time. Tweezers work well for placing the tiny pieces of solder onto the metal. When placing solder on the metal, it should be positioned between the areas that will best join the metal. A little solder will go a long way if placed correctly. Unfortunately, this requires some practice. 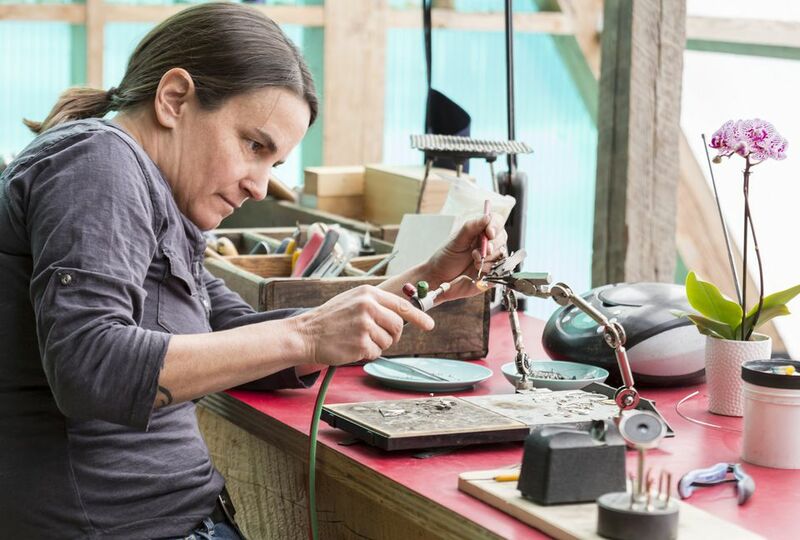 Once the solder is in place, it’s time to start up your torch. First, all the metal should be heated so that the temperature for soldering is reached at the same time. The solder will follow your heat, so try not to point the flame right at the solder. Instead, you want the flame to draw the solder through the joint being connected. Continue to keep the flame on until you will see the solder run, then remove the flame immediately. Using tweezers or pliers, pick up the hot metal and drop into a jar of water. If you need to solder the piece again, you’ll need to repeat these steps. Remember to change to a different kind of solder, either medium or soft. as described previously.